Horror icon Stephen King wrote five novels before hitting it big with Carrie. The lesson here is threefold: a) Never give up; b) A masterpiece may lie just around the corner, and c) If you’ve got the dream, the drive, and the talent, you’re going to make it, pure and simple. Such is the case with Austin, Texas artist Dane Phillip Smith. He’s only released two CD’s thus far (his debut, I’ll Carry On, is also available for purchase and download via his website). Nevertheless, his electric blues-rock musicianship has the hallmarks of a master in the making. He’s certainly got the chops on guitar, and his lead vocals are one part Phil Collins and one part Randy Newman. With postmodern nonchalance, he plays his way through ten original tracks, which is a big boon. 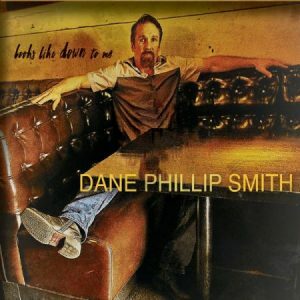 Dane Phillip Smith’s love for rhythm, blues and roots music started at the age of thirteen. Hailing from Columbus, OH, he fell in love with this magazine’s favorite genre when he first heard Chicago blues on a PBS radio broadcast. As for his songwriting, it draws from multiple styles, including soul, jazz and rock. This eclectic influence is paramount, but that’s no reason to dismiss it. On every note and in every riff, listeners can hear deeply-imbued passion. His songwriting is already a cut above the usual, presenting fresh lyrics in unique arrangements. Performing alongside our front man (lead vox and guitar) are Nico Leophonte on drums; Michael Weston Archer on acoustic and electric bass; Matt Ferrell on B3 organ and electric trombone; Matt Hubbard on trombone; Johnny Moeller on rhythm and lead guitar for track eight, and Lauren Cervantes and Angela Miller on background vocals. It’s hard to pick the three best songs on this album, but in terms of high energy, these are tops. Track 01: “Devil Mind” – Sometimes having a diabolical frame of mental reference doesn’t mean one plans to kill or do other wicked deeds. In the case of our narrator, having a “Devil Mind” is more of a funk: “Well, I’m confused. I’m overwhelmed. I’m flying high; I’m crashing down. I hate my game; it’s all the same, and I’m always searching for someone to blame. I want to be the light, but I’m driving blind. I’ve got a devil mind.” With a gritty low-note intro and edgy B3 organ from Matt Ferrell, this opening tune will break anyone out of the doldrums. Track 05: “I Need a Change” – A jazz-influenced number with New Orleans flair, track five expresses a feeling all of us have had at one time or another. “Same old thing, a different day; I need a new scene in this one-act play.” This could very well be a show tune on Broadway if it got the right attention. Matt Hubbard guest stars on tongue-in-cheek trombone. Track 08: “(Don’t) Play with Fate” – “If it ain’t broke, don’t fix it.” So says the old saw, especially when it comes to tried-and-true methods of doing business – or conducting romance. Get out on the dance floor, people, because nothing will make your feet move to the beat than this Chicago-style shuffle. Not only is the guitar (featuring guest start Johnny Moeller) spicier than hot sauce, but the other instrumentation is perfectly balanced as well. Looks Like Down to Me will surely find its way UP on the blues rock charts in no time!